There’s this thing called running. I don’t know why people do it. I’m still trying to figure out why I do it. 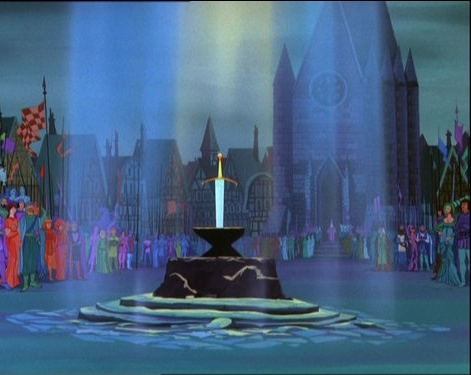 The idea of completing a marathon is like looking at the sword in the stone: completely unattainable. I was suckered into my first half marathon in the name of Jesus. Yes, that means a missions fundraiser. My second half marathon was in the name of womanly bonding. Yep. A crazy awesome group of six decided we wanted to bond as women of Christ, so we signed up for the Disney Princess Half Marathon. There’s a lot of ways to bond, let’s be real. Running? I’m still in shock I signed up to run that far again. At least this time we got to make cute outfits, run through Disneyland, and kill a good hour of “on the clock” time taking pictures with my favorite characters! Then, I started thinking about a full marathon. I’ve never been a runner. This is pretty ridiculous. However, I talked about it just enough I had to find out if I could do it. So, I signed up for the Atlanta Marathon in October. By myself. No outside influence. Why do we do things like this? Why do we sign ourselves up for the impossible? I think it’s the challenge. I think it’s the self-discipline of time, energy, and physical strength beyond our normal routine that pulls at a place within our soul. 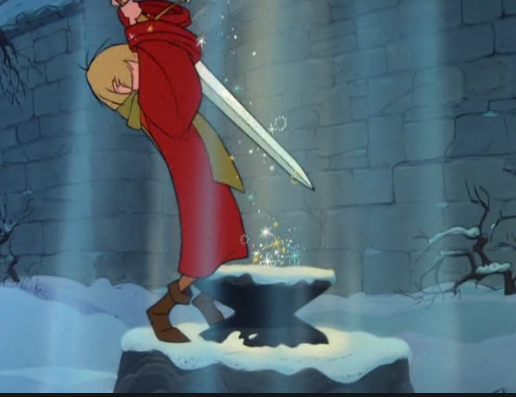 I think it’s a little like Arthur in the Sword in the Stone. It was an absolutely absurd thing for a scrawny little wart to believe he could pull a sword out of a stone, a picture of strength that every manly man had attempted. He was just a skinny servant boy, dreaming about things that were way out of his league. I can identify. I know it’s an absolutely absurd thing for me to believe I can run a marathon. If you asked any of my softball or soccer coaches growing up, running was never my forte. My soccer coach used to say “Nicole was at her prime when it rained. Rain seemed to slow everyone down to Nicole’s pace, and then she could really show off her strengths.” I was the softball pitcher who sometimes had a pinch runner go in for me. Ya, I was that girl. Now we’re talking 26.2 miles, not having anything to do with a ball. Or Disney. What the heck am I doing? While I knew it would be difficult, I knew what it would take to complete a marathon: a lot of self-discipline. 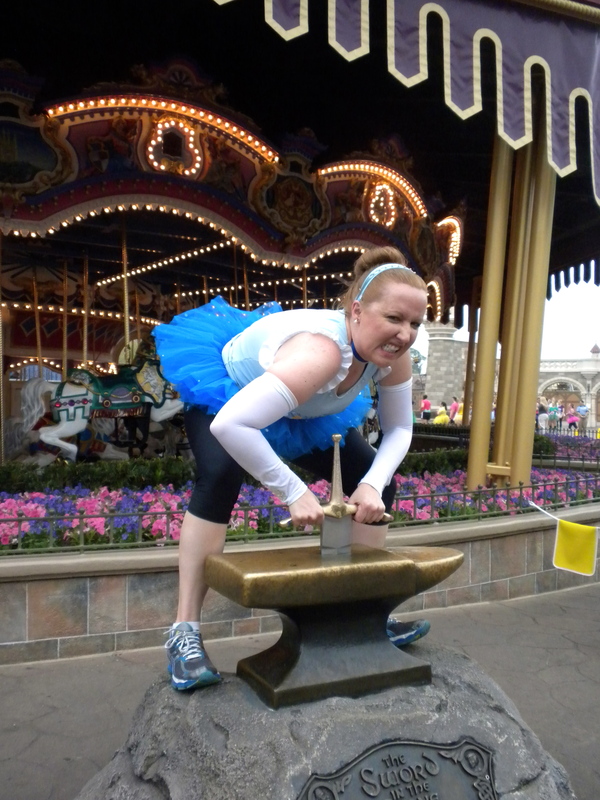 As I learned with the half marathons, if I was willing to train, it was possible. My spiritual life is a lot like this, too. Sometimes God shows up into our lives and begins training us for something we can’t even wrap our minds around. I can’t wrap my mind around 26.2 miles, either. We typically respond like Arthur with Merlin, where we question God’s sanity and why He’d even pick us, the most unqualified person ever. Then, God will show off his skills so we can trust in Him, and we commit to do whatever weird thing He tells us. It’s crazy when you think about it. The marathon, for me, has become a living testimony of my spiritual life. I have to keep going, I have to persevere, I have to fix my eyes on Jesus and press on toward the goal. I don’t want to live my life limited by impossibilities. It might rain on my parade, or I might trip and fall on my face, but I want to dream big with God and let Him show me the steps to get there! Thanks! it’s true- life is a bit of a marathon. And, Disney is by FAR the best way to run! I mean, you pay for it, but it’s magical! 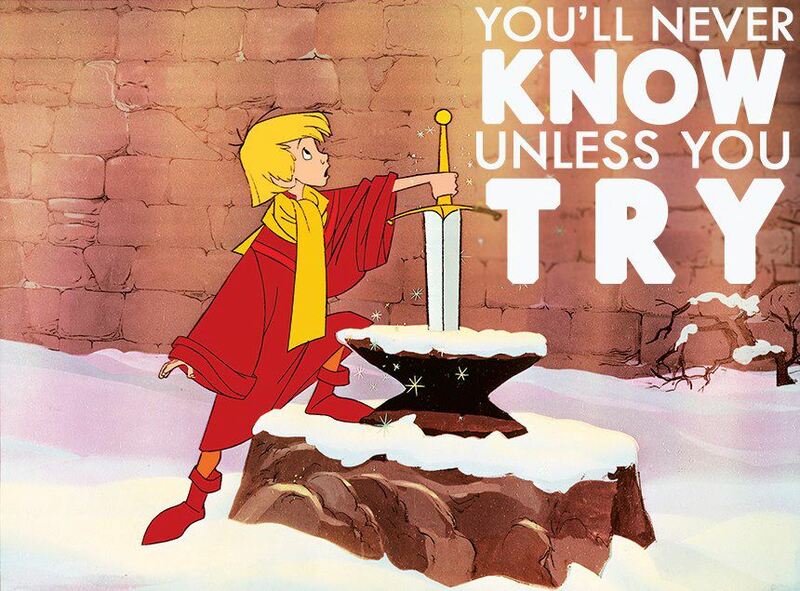 I love The Sword In The Stone!!!! Yes, I am thirty something years old and I own the dvd. 😉 It is a great story, isn’t it? A great illustration of dreaming big and not being afraid, and trusting God to lead us to our goals! Great post! Thank you! Yes, God always illustrates His heart to me through Disney, too! 🙂 I love it!